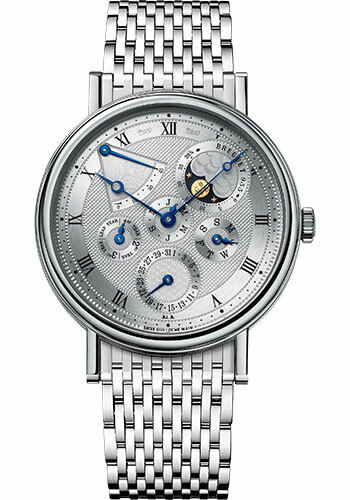 39mm 18K white gold case, 9.05mm thick, sapphire crystal back, silvered gold dial, caliber 502.3 DRP1 self-winding movement with perpetual calendar showing the day, date, month, leap year and the phases and age of the moon, approximately 45 hours of power reserve, 18K white gold bracelet. Water resistant to 30 meters. 39mm 18K rose gold case, 9.05mm thick, sapphire crystal back, silvered gold dial, caliber 502.3 DRP1 self-winding movement with perpetual calendar showing the day, date, month, leap year and the phases and age of the moon, approximately 45 hours of power reserve, 18K rose gold bracelet. Water resistant to 30 meters.